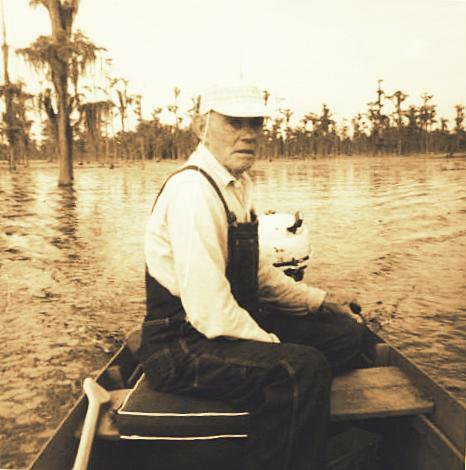 William Lonnie Royal was born June 13, 1897, at Homerville, Clinch County, GA. He was a son of Gabriel Marion Royal and Vercy Lee Fender. Some time after 1910 his father rented a farm at Ray City, GA and this is where Lonnie grew to be a man. On June 21, 1917 William Lonnie Royal married Utha Gertrude Mixon in Berrien, Georgia. The ceremony was performed by Lyman Franklin Giddens, who was Justice of the Peace at Ray City. Utha Mixon was a daughter of Mary Elizabeth Clance and William Henry Mixon, of Ray City. When the 1918 WWI draft registration occurred, Lonnie Royal was 21 years old and living and working at Ray City. He was of medium height and build, with blue eyes and dark brown hair. 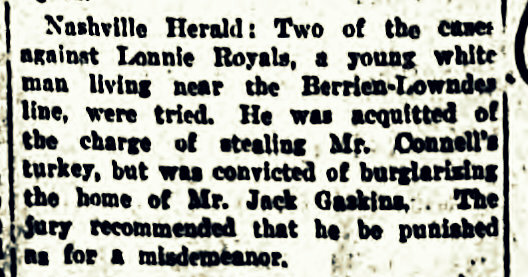 He was working for Daniel Jackson “Jack” Gaskins, a farmer in the Lois District just west of town. He listed Frank Royal, of Ray City, as his next of kin. April 4, 1919 – Lonnie Royal was convicted of a misdemeanor theft. Lonnie was acquitted in the case of the turkey heist, and apparently the jury took pity on him in the burglary case as they recommended sentencing for a misdemeanor crime. Lonnie and Utha made their home in the Ray City area for many years.